The family Alytidae consists of small to medium-sized frogs generally found associated with water and having a biphasic life history, with type III pond-type larvae that retain ribs post-metamorphosis. Frogs known as the Midwife Toads (Alytes) look superficially like toads, and the males attach egg clutches to their back and thighs as a form of parental care. 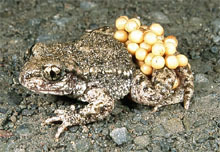 The male carries the clutch until the larvae are ready to hatch, at which point he releases the tadpoles into bodies of water. Alytidae also includes Latonia nigriventer, which was thought to be extinct when its wetland habitat in the Hula Valley of Northern Israel was drained in the 1950's for development. In 2011, it was rediscovered in remnant wetlands and since has been found in nearby ditches and drainages. With new molecular samples, it was placed in Latonia, sister to Discoglossus. This is a primitive species group of two subfamilies, Alytinae and Discoglossinae, which Black et al (2010) calculates to have diverged from each other in the Cretaceous. Alytidae is the sister group of Bombinatoridae. Blackburn, D. C., D. P. Bickford, A. C. Diesmos, D. T. Iskandar, and R. M. Brown. 2010. An ancient origin for the enigmatic Flat-headed Frogs (Bombinatoridae: Barbourula) from the islands of Southeast Asia. PLoS (Public Library of Science) One 5 (8: e 12090): 1–8.